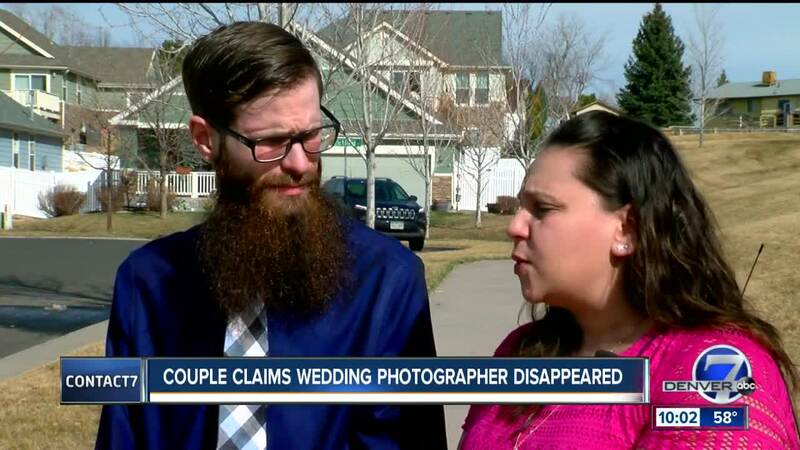 DENVER — A local couple married in July 2018 said their wedding photographer has been avoiding them for months. So, they reached out to Contact7 for help. Rosetta and David Knudsen said they haven’t seen a single photo Joseph Tyler Niemczyk, with JTN Photography, took on their wedding day. They hired JTN Photography after looking on TheKnot.com and said they paid him in full. He was there for every moment of their special day. Rosetta said Niemczyk texted her a month after the wedding and told her that she should receive her photos within a couple of weeks. But the couple says they never got the photos. "He did reach out to us in October, and he said he had moved three times in the last three months and lost a few jobs, and that he still had the photos and he promised he would send them," Rosetta said. They spent months after that trying to contact him with no response. Their attorney sent him half a dozen letters and filed a complaint with the Better Business Bureau but claim the case was closed when Niemczyk never responded. Now they just want their photos, so they have memories to share with their future children. "The money we could care less about,” David said. “It wasn't a life savings amount or anything like that. It really is the photos. Denver7 called Niemczyk twice, and each time he hung up on us. He then emailed the couple saying he still had the photos and would give them to them. But it’s a promise they have heard before.